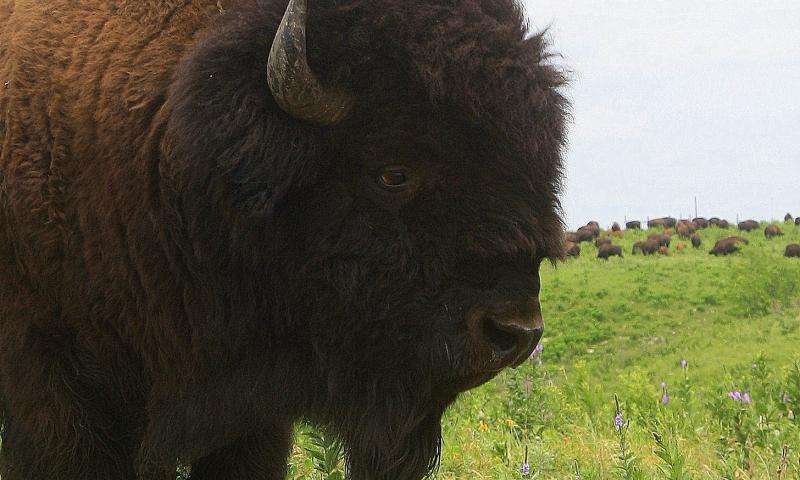 Kansas State University's Jill Haukos, director of education at Konza Prairie Biological Station, shares five facts about bison at Konza Prairie Biological Station in honor of the National Bison Legacy Act. President Barack Obama signed the act into law May 9. It makes the American bison the U.S. national mammal. 1. Bison are extremely dangerous. Even though bison appear docile, they can move very quickly and aggressively, especially if something or someone gets between a cow and its calf. Bison can run up to 35 miles per hour—faster than the fastest man—and can pivot very quickly. The bison at Konza typically weigh around 800 pounds for an adult cow and 1,500 pounds for an adult bull. 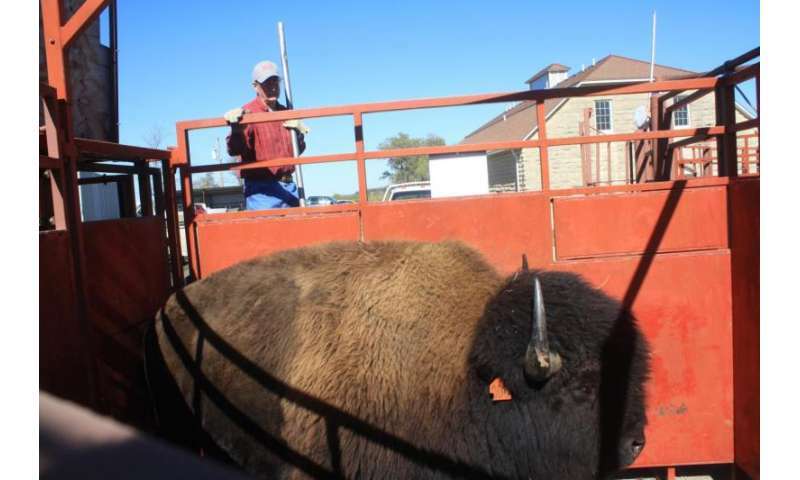 The largest bison ever at Konza, a 7-year-old bull, was 2,050 pounds. 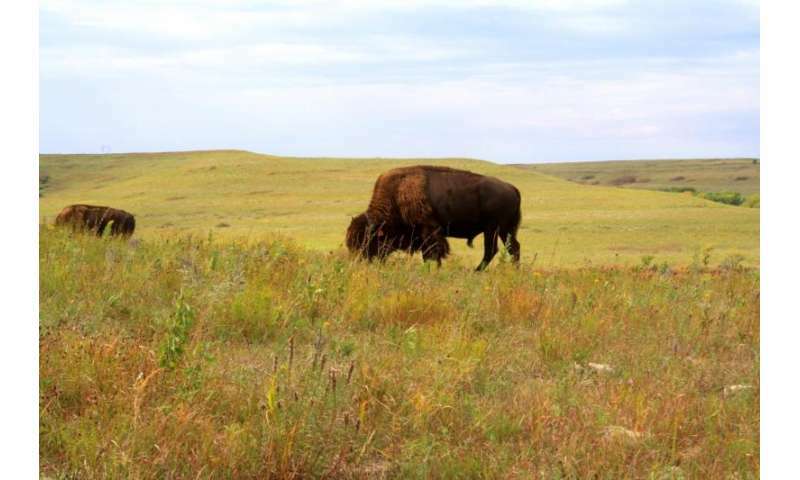 Researchers on Konza Prairie have to pay close attention when working near the bison and must keep an eye out for the calves. Spring is the season when new calves are born and bison mamas are very protective. Konza Prairie guidelines require researchers keep a vehicle nearby to escape if a bison comes too close and researchers never work alone around bison. 2. Bison need large spaces to roam and forage. The bison at Konza can roam freely on 2,375 acres. The bison remove approximately 25 percent of the above-ground plant productivity. They eat mostly grass but will eat other plants, especially if the grass isn't available. 3. Bison evolved for the extreme weather of the Great Plains. Bison do especially well in the winter with their thick, warm coats and their heavy, muscled heads that allows them to power through deep snow. Unlike cattle, bison don't lie in water during the summer. They shed a layer of hair and then coat themselves in mud by rolling in dirt—making buffalo wallows on the ground—to try to escape the ever-present biting flies. Bison do not seem to be affected by extreme weather, such as wind, rain, hail or fire—all common elements on the Konza Prairie. 4. Bison are very influential members of the prairie. 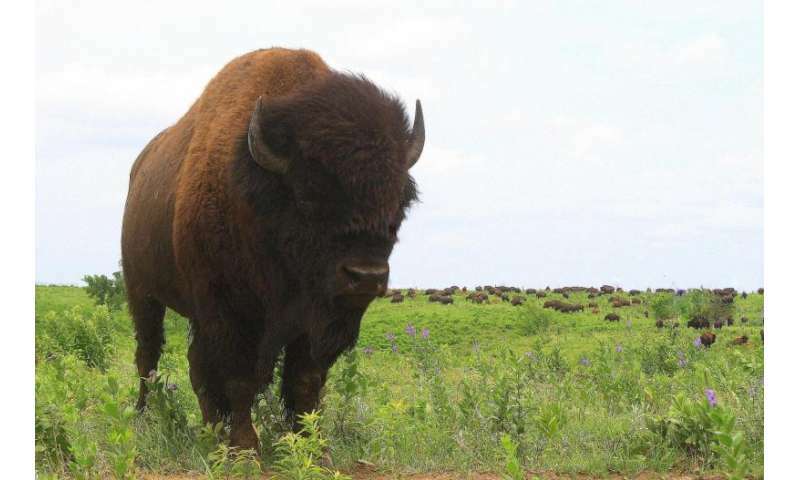 Kansas State University ecologists consider bison a key species for the prairie ecosystem. Bison work together with fire to increase the diversity of plants and animals. They eat grasses and fertilize other plants with their waste. This interplay of grazing and fertilization results in a network of life that is enhanced by adding fire. Fire helps to maintain a prairie by keeping out wooded plants like trees and shrubs. Putting all of the pieces together makes for a healthy ecosystem. 5. The Konza Prairie herd is wild. The Konza bison are not domesticated. The herd comes to the bison corral once a year for weighing and removing selected members—otherwise, the herd is left alone. Konza managers do not use horses to herd the bison in to the corral. They use treats—such as alfalfa and molasses/range cubes—to lure them. The Konza Prairie managers use their vehicles' horns and drop range cubes along the trail to lead the bison slowly toward the corral. If the bison is a symbol of the new United States, then it is a symbol of the debt burden of the country. The U.S. used to have an eagle for the single digit debt burden in the trillions. Now we need a bison to symbolize the debt burden of over 20 trillion! Holy Cow!